Some of us get crazier with the Layers Panel than others. And UI's can always be improved. Well, when working on one of my website designs I often have copious amounts of layers to deal with and need to jump around a lot, needing to select certain Layers or Layer Groups quickly, make changes and move on. To help in this regard, I am suggesting a very modest and easily implemented (I would think. I try to make no assumptions when it comes to real software dev.) change to the Move Tool's right-click menu -something invaluable to me that helps me quickly to get around my Layers Panel. >>> Why not give the currently selected Layer or Layer Group's row in the Move Tool's right-click menu a highlighted background (see right side of below linked image) so you're instantly aware of which Layer or Layer Group is currently selected (just like the Layers Panel does) and therefore know whether something in the Move Tool's right-click menu is ABOVE or BELOW what you currently have selected. --- This will give users improved awareness of where they are in the document. 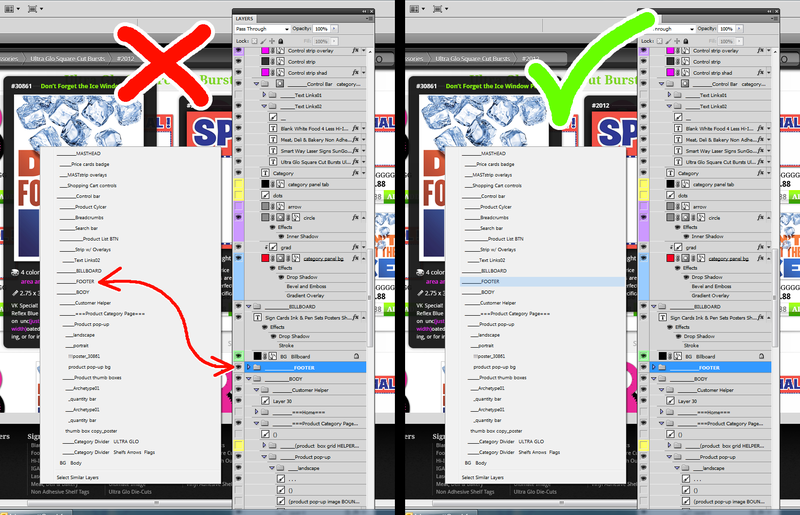 --- Navigating PSDs with hundreds of layers can be frustrating. It's both the user's job to organize his PSD but also the UI's job to alleviate as much of that frustration as possible by offering smart features.